Vietnamese cuisine with a myriad of tempting dishes is waiting for you to discover. If you are a food lover and always want to discover the hidden beauty of Vietnamese cuisine, Vietnam food tours to discover exciting food will be a hint for you! Com Hen (Rice with Mussel) is a specialty of Hue and only in Hue, Rice with mussel has its own unique flavor. With just very simple ingredients including mussel broth, mussel, fried pork skin, rousong, chili sauce, pepper, garlic, ginger, roasted peanuts, salt, sesame, vegetables, and cold rice local people in Hue create a strange food, attracting every visitors coming here. The attraction of mussel rice is not only from the bowl of delicious mussel soup but also from the spice tray accompanied with this tasty dish. Enjoying this specialty, guests can themselves create a dish for their own – diners can add spices to their own bowl of mussel rice according to their taste, so mussel rice will have the different flavors when being served to different visitors. If you have once come to the land of Quang Nam, you will certainly not forget a simple food with rustic and attractive flavor – My Quang (Quang noodle). Perhaps the first impression of a visitor when eating a bowl of my Quang is that noodle does not have too much broth such as other types of noodles, but it is so delicious. For many people, it is quite dry and boring, but that is the charm of my Quang – less broth but rich flavor. A bowl of noodle soup must be eaten with raw vegetables and little-roasted peanuts with a small amount of rice paper. Beside Quang Noodle, Cao Lau is a specialty that can not be missed when coming to Hoi An. Although influenced greatly from Chinese cuisine and Udon noodles of Japan, Cao Lau has still kept intact all beautiful features of Quang Nam – rustic, simple but extremely attractive. 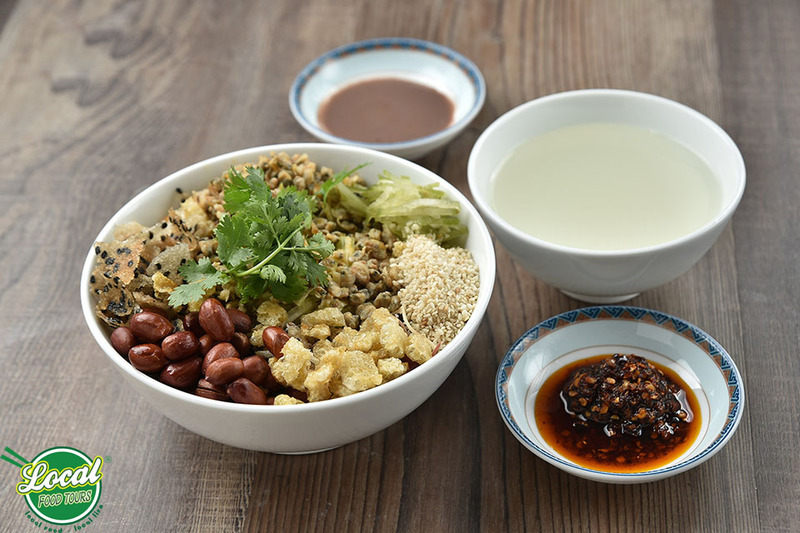 Although cao lau has “spread” all over the country, certainly you will not be able to enjoy any cao lau more delicious than that in Hoi An – the hometown of this dish. Coming to the coastal city of Nha Trang, there is a specialty that no visitors on Vietnam food tour can ignore that is Nem nuong Ninh Hoa (grilled fermented pork meat). Biting a piece of nem Ninh Hoa, enjoy the strong taste of the banana, the pungent of onions, the sour taste of mango, the fragrance of the shallot, crispy taste of rice paper, … The delicious taste of nem dipped into the unique sauce, All blend together and create a really amazing taste for the diners. It is so extremely popular dish in Saigon that when people mention about Saigon cuisine, all visitors on food walking tour will think of com tam (broken rice). Visiting a restaurant serving com tam, it will be difficult for visitors to resist the smell of barbecue spread from the red coal kitchen. With a plate of broken rice with ribs, pork pies, fried eggs, and a little pickle, herbs, you have a perfect meal in Saigon. If you have visited Ben Tre it would be a shortcoming when you do not bring yourself a few boxes of coconut candy – the specialty of Ben Tre. The best way to enjoy a piece of Ben Tre coconut candy with full of deliciousness is to let the thin layer of rice paper slowly dissolve in the mouth and gradually enjoy the fat and sweet of coconut candy. It will be amazing and awesome.